Nuclear structure; compressed ﬁnite nuclei; 𝛥-resonance. Within the framework of the radially constrained spherical Hartree–Fock (CSHF) approximation, the resonance effects of delta on the properties of neutron-rich double magic spherical nucleus 132Sn were studied. It was found that most of the increase in the nuclear energy generated under compression was used to create massive 𝛥 particles. For 132Sn nucleus under compression at 3.19 times density of the normal nuclear density, the excited nucleons to 𝛥s were increased sharply up to 16% of the total number of constituents. This result is consistent with the values extracted from relativistic heavy-ion collisions. The single particle energy levels were calculated and their behaviours under compression were examined. 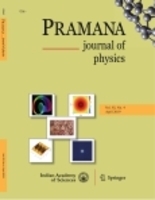 A meaningful agreement was obtained between the results with effective Hamiltonian and that with the phenomenological shell model for the low-lying single-particle spectra. The results suggest considerable reduction in compressibility for the nucleus, and softening of the equation of state with the inclusion of 𝛥s in the nuclear dynamics.